Imagine you're a small or medium-size food business, offering premium quality products for sale through supermarkets. The supermarkets are squeezing you on price, because your sales volume doesn't give you much negotiating power. You need to build demand for your products, but you can't afford a big advertising campaign. What can you do? Fast - A recipe app designed for busy people who appreciate good food. Follow the step-by-step cooking instructions. Use the shopping list, which sorts ingredients by recipe or department. Fresh - We’ve hunted down the best quality ingredients from right here in New Zealand. Our app stays fresh too, with free seasonal updates to keep you as fresh as. Fast, Fresh & Tasty was rated by test users as being as good as the top selling apps from the likes of Jamie Oliver and Nigella Lawson, with the added benefit of being seasonally and regionally topical. The pilot version is aimed at New Zealand, with other regions such as Victoria or the tri-state area in the eastern USA to be added as the business expands. All well and good, but what makes Fast Fresh & Tasty especially interesting is that it offers food brand partners the opportunity for subtle product placement in the recipes. To keep faith with its users - premium food buyers - Fast, Fresh & Tasty imposes strict controls on who can be a brand partner and on the recipes themselves. Even sceptical testers found the product placement acceptable and the links to product information useful. So Fast, Fresh & Tasty earns its money two ways: from shoppers buying the app (at a fraction of a cookery book's cost), and from brand partners buying exclusive product categories to feature their products in relevant recipes alongside complementary ingredients from other brand partners (at a fraction of normal advertising costs). Fast, Fresh & Tasty is available initially for iPhones and iPads, but a version for Android phones and tablets is planned later. 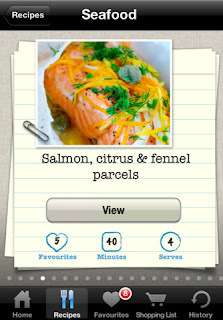 Disclosure: I am chairman of Click Suite, which designed and developed the Fast, Fresh & Tasty app. Click Suite is a 50/50 partner in the Fast Fresh & Tasty business, alongside the idea's creator Karin Grice.